Pattern Row 2 - ch1, 1sc in base of ch1 * skip ch1 and 1dc, 5dc in space between skipped dc and next dc, skip ch1, 1sc in next dc, * rpt from * to * to ch4 to turn with, 1sc in 3rd of ch4. Turn. Pattern Rows 1 & 2 form the pattern, rpt both rows until six 5dc group rows have been worked in all or work is approx 5.5 inches from crown. Fasten off. Turn. With RS facing, starting with ch3, work 38dc evenly in row ends along neck edge. Fasten off. Next Row - With front of bonnet towards you ch1, 1sc in base of ch1 * skip ch1 and 1dc, 7dc in space between skipped dc and next dc, skip ch1, 1sc in next dc, * rpt from * to * to ch4 to turn with, 1sc in 3rd of ch4. Turn. Fasten off. Picot Row - With main color yarn ch1, sl st in base of ch1, * 1sc in each of next 4dc, ch3, sl st in 1st ch (picot made), 1sc in each of next 3dc, sl st in sc, * rpt from * to * to end. Fasten off. Picot Row - With main color yarn, ch1, sl st in base of ch1, * 1sc in each of next 3dc, ch3, sl st in 1st ch (picot made), 1sc in each of next 2dc, sl st in sc, * rpt from * to * to end, sl st to sl st on beginning of row. Fasten off. Finishing - Weave in loose ends of yarn, thread ribbon through alternate dc's around neck edge and tie with a bow. Can be put with FJC33 (click link to see pattern) to make a set. 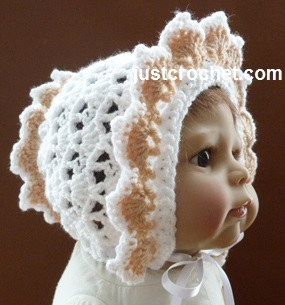 Hope you enjoy this free baby crochet pattern for a frilled bonnet.